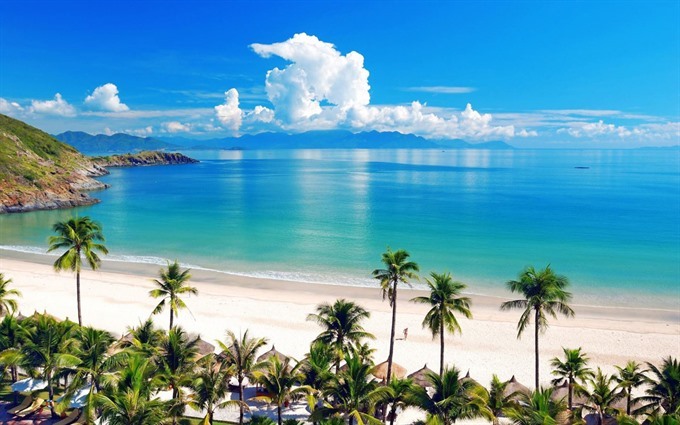 Nha Trang is gearing up for the 2019 National Touridm Year themed "Nha Trang — Colour of the Sea". Bui Quynh Hoa shares her trip to Tu Binh, four wild and amazing islands (including Binh Ba, Binh Hung, Binh Tien and Binh Lap) in the southern central province of Khanh Hoa. A few days ago, four of our six-member group had struggled with relationship problems, leading to some calls to cancel the trip entirely. Everyone was in a bad mood and our enthusiasm for exploring the charms of Tu Binh had been dampened. 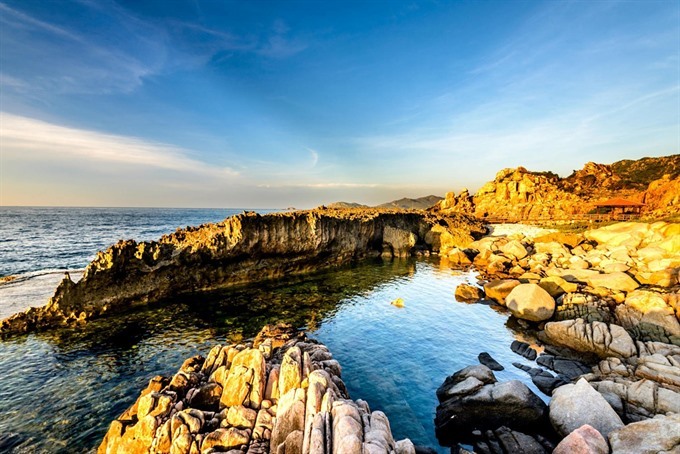 The area was made up of four primeval islands including Binh Ba, Binh Hung, Binh Tien and Binh Lap, in the southern central coastal province of Khanh Hoa. The boat trip to Binh Ba Island was accompanied with bright sunshine, and we were dropped off on a white sandy beach. The pure sea air and untouched beauty of the island helped lighten our mood. 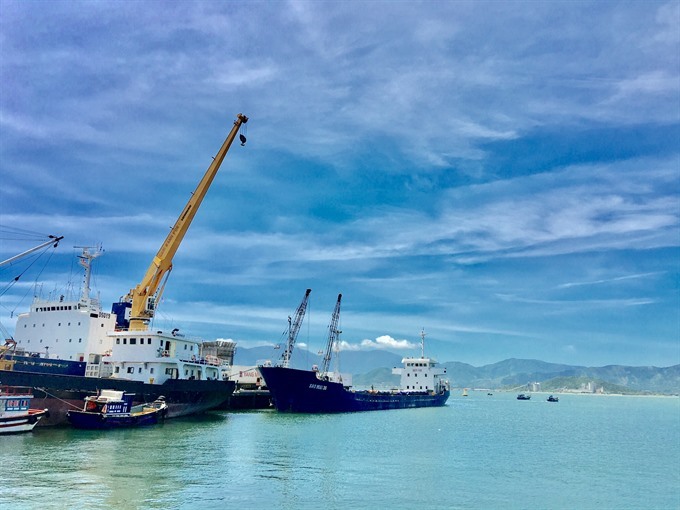 “When I set foot on the island, I was immersed in calm, with white sand, blue sky and crystal clear water,” said Le Yen Chi, a member of our group. “There aren’t many tourists here, that’s why the island is still wild and natural,” Chi added. After enjoying a big lunch and a two-hour rest on Nom beach – one of the most beautiful beaches on the island with incredibly white sand and impressive rocks – we took motorcycles to the top of the mountain where we could admire the view of the island and part of Cam Ranh Bay. On the other side, gentle pink grass swayed lazily in the cool breeze as the sunset turned the sky purple. We took pictures until the light faded. It was a full moon, so it wasn’t difficult to find our way back down to a big floating restaurant where we would enjoy our evening meal. Binh Ba is dubbed "the island of lobsters", so we chose grilled lobsters caught from underwater cages for our main course. We had also urchins, sea snails, squids and salad. 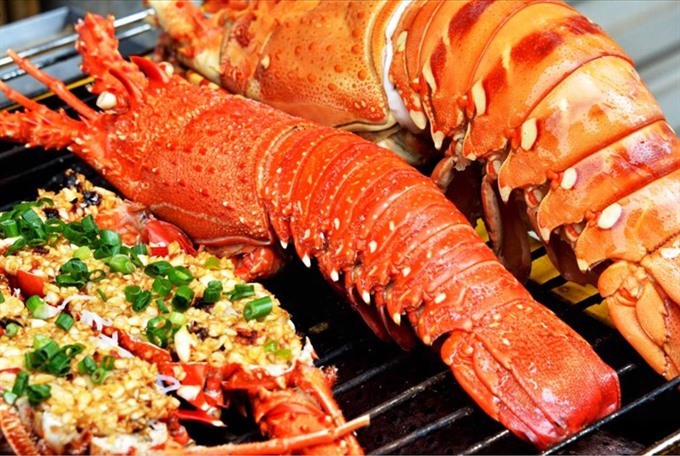 The seafood was cooked simply – steamed or grilled or raw – to maintain the fresh flavour. Relaxing and singing after a hearty meal, thinking of loved ones under the moonlight, one can’t help but be enchanted by this place. At midnight, we returned to our rest house on the beach. “Sitting on silky sand under a full moon and a sky full of twinkling stars was an amazing and memorable experience for me,” Chi said. “This is my second visit to the island, but this time I really appreciate its untouched beauty,” Le Kim Phuong, another member of our group, said. “It’s an idyllic place for lovers,” she claimed. We woke up early the next morning and were eager to explore another beach named Chuong on the island and enjoy the sunrise. After taking lots of photos, we returned to find a market buffet right in the centre of the island. They sold a variety of fruits and vegetables, with local specialties at low prices. 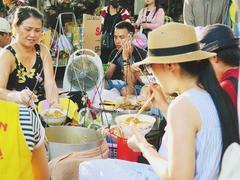 The food stalls were packed with people enjoying a morning meal. We found ourselves drawn by delicious flavour that filled the air. We admired the island from a cafe halfway up the mountain which was decorated with an abundance of flowers and was enchanted by romantic melodies. A boat from Ba Ngoi Wharf would take us to our next stop – Binh Tien Island, which is considered a green pearl surrounded by pine forests and limestone mountains. We stayed at Aloha Hotel, which offered standard rooms and services, but at a reasonable price (about VND450,000 or US$20 per room per night). The island is untouched, helping preserve the feeling of tranquility. One mustn’t miss a barefoot stroll to watch the sea, or sit on cliff to enjoy fresh air and the sunset. 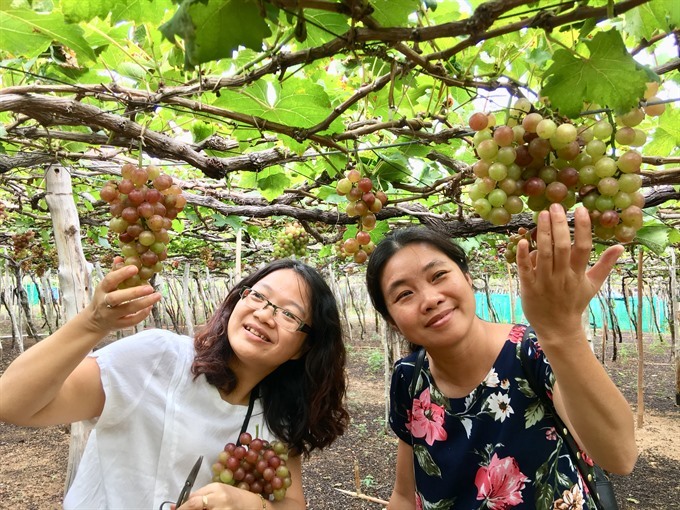 On the third day of our journey, we had breakfast in Vinh Hy Bay, and left for Thai An Village, one of two largest vineyards in Ninh Thuan Province, which is considered the country’s largest grape producer. 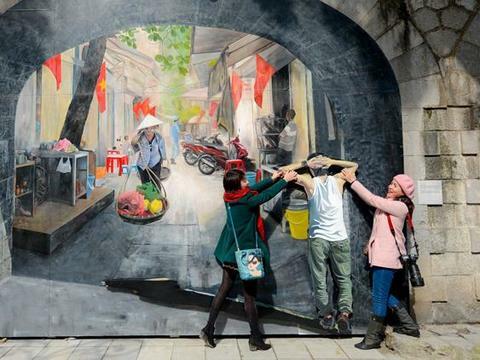 “It’s exciting to buy fresh grapes I picked myself, and taste homemade wine,” Phuong said. In the afternoon, we explored Hang Rai or Otter Cave, located in Nui Chua (God Mountain) National Park in Ninh Hai District’s Vinh Hai Commune. The special terrain of rock piles accumulated over centuries included many caves that were home to otters, hence the name. The cave was a rocky outcrop on the coast that offered endless opportunities to take in the beauty of sunsets and daybreaks. We gasped as the water changed colour while the sun’s creativity ran riot. 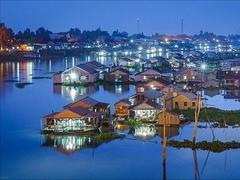 Part of the Tu Binh islands, Binh Lap is less well-known because of its isolated location. Although it is a peninsula, it is secluded. We headed to the Sao Bien Resort on the morning of the fourth day to check-in before a storm arrived. At the entrance to the resort, visitors had carved their names on board of colourful wooden hearts. On our way back to Aloha Hotel in the afternoon, the storm hit the peninsula. Strong winds and heavy rain flooded the roads and power was shut off. We had our dinner by candle light at the Gio Bien Restaurant. Instead of driving motorcycles from the restaurant to our hotel, we had to walk in the floodwater. Luong Ngoc Hai, another member of our group, lost a sandal. He threw away the other and bravely continued walking barefoot. Later he realised his mistake when the road was full of gravels. Seeing us wading through floodwater, some locals standing on the side of the road shone flashlights to show us the way. We were impressed with their kind-hearted act. After the storm, the sky was clear again as if nothing happened. The blue sky and blue sea seemed to blend together as one. Even though there were huge rocks and trees on the road, we soldiered on to Binh Hung Island. 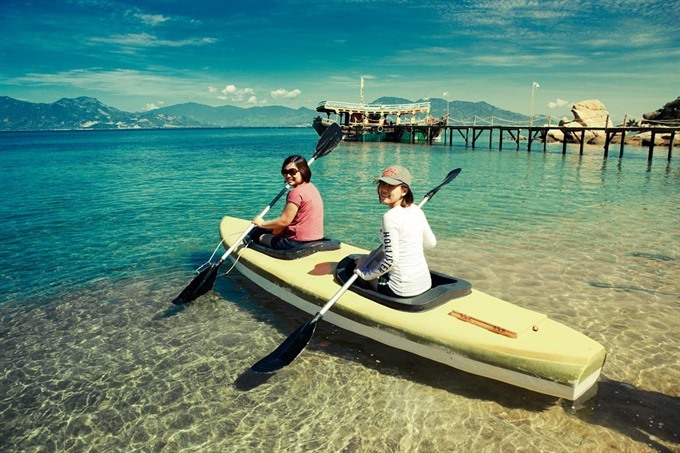 We didn’t want to miss one of the most beautiful islands in Cam Ranh, on the last day of our journey. Again, the island is ringed by clear water and white sand. It’s not deep, but just wading out a few metres, the water was already at our chests. And we could see coral reefs below the surface.